Workman Publishing Company, 9780761165217, 340pp. Love Indian food but feel it's too daunting to recreate at home? Those complex authentic flavors! Those dozens of spice blends! The long prep time! Fear not. Award-winning cooking teacher Raghavan Iyer puts the breeze and ease into Indian cooking. Taking a heavily illustrated, step-by-step approach, he introduces cooks to one of the world's most popular cuisines. With his natural charm and enthusiasm, Raghavan begins each chapter by explaining the recipe choices, what techniques are included, and a suggested order in which to approach the recipes. The book's 100 authentic recipes use only ingredients readily available at the local supermarket. Taking into account time restraints, each dish can be quickly assembled and will give home cooks the confidence to create knockout Tandoori Chicken, Coconut Squash with Chiles, Turmeric Hash Browns, Saffron-Pistachio Ice Cream Bars, and Mango Bread Pudding with Chai Spices. From basic breads to chutneys and savory pickles, from tasty dal to fragrant basmati rice pilafs, from crispy starters to enjoy with a Slumdog Martini, Indian Cooking Unfolded is a 21st-century approach to one of the most ancient—and popular—cuisines. 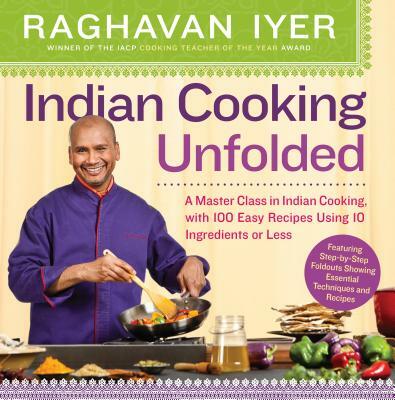 Raghavan Iyer, an IACP Award–winning Teacher of the Year, is the author of Indian Cooking Unfolded, 660 Curries, Betty Crocker’s Indian Home Cooking, and the James Beard Award Finalist for The Turmeric Trail: Recipes and Memories from an Indian Childhood. He is a spokesperson and recipe consultant to General Mills, Target, and Canola, among others. Mr. Iyer is also host of the Emmy-winning documentary Asian Flavors. Articles by him have appeared in print and online in Eating Well, Cooking Light, Fine Cooking, Saveur, and Gastronomica. Born in Mumbai, Mr. Iyer lives with his family outside of Minneapolis, Minnesota.